Do Catholics Really Believe Grace is Created? Topic: Do Catholics Really Believe Grace is Created? ^ Just to clarify, Catholics also believe that grace is God as well, not just an object. That's interesting but instead of clarifying as you intended I think you have just muddied the waters. I thought that Catholics see prevenient grace, actual grace and the other types of grace as created, in other words definitely NOT God who of course was not created. Maybe, Father, if you want to discuss this subject with Papist you should follow Papist's advice and encourage him to start another thread on this. Thank you for the suggestion, Peter, but I don't want to discuss this subject with Papist. I wanted to remind him that we have been round the mulberry bushes a few times already on this topic on another forum. Not at all. I have clearly stated that I do not wish to pursue with Papist the Catholic teaching on grace and I am sure that Papist did not introduce the topic with the intention of derailing the thread. Also, if you look at message #6 you will see that I have referenced two messages which connect with the OP's question. Sorry. didn't realize the thread is about you. I don't believe it is, George, but you are continuing to take the thread away from the OP's questions. Re: Do Catholics Really Believe Grace is Created? Thank you Peter (the Faith Issues section moderator) for splitting this thread off from where it was derailing another thread (http://www.orthodoxchristianity.net/forum/index.php/topic,20814.0.html) and moving it here because it is an issue I have wondered about. To my understanding (which may be wrong) the Roman Catholic Church teaches the existence of both created and Uncreated Grace, and identifies the latter with the indwelling of the Holy Spirit. Is this a correct understanding? The "rediscovery" of uncreated grace in the West commenced in the late 1930s and the 1940s with the writings of the eminent Catholic theologian Karl Rahner, a Jesuit theologian who died about 20 years ago. He moved Catholicism away from its scholastic approach and closer to the patristic approach of earlier centuries. Rahner was the most noteworthy and influential Roman Catholic theologian of the 20th century. His theology and his approach to theology had a decisive effect on the Second Vatican Council. However as far as I am aware his ideas on uncreated grace remain a matter of opinion within theological circles and have not been proclaimed as official Roman Catholic doctrine. I invite correction from the forum's Catholics where I am wrong. From the Catholic Perspective: We define sanctifying Grace as God's life in us and we can refer to this as both created or uncreated grace. It is uncreated grace if we focus on the fact that it is God's life, his very self (his energies in Eastern termonology) . We can call it created grace when we focus on the "in us" part. The state of God's grace being within us is a created state. We did not always exist and thus God's life could not be in us until we were created. Thus we have the Catholic Concept of the State of Grace. Recap: the substance of Grace is uncreated; it is God himself. However, the state of God's life being within us is a created state because we did not always exist to have God in us. Would you please show us where the above is defined Catholic dogma? There appears not to be identification of God and sanctifying grace. Instead Aquinas appears to see sanctifying grace as the means and the vehicle by which God is able to be present in a person. I realise that people will point out that Aquinas' teaching is not worth straw since it has not been officially promulgated by the Popes, but on the other hand neither has what you are saying above, to the best of my knowledge. That is why references are so important. No, i don't think Aquinas' teaching is worth straw. He is the universal doctor and we should not stray from his teaching expect for very very very good reasons. During study hall i will explain to you why you interpretation of Aquinas not very good at all. Father Ambrose, I do fear entering into this topic with you for one major reason. As I have stated before, a conversation with you is often a trip down the rabbit hole. I am going to start this conversation assuming that you are going to converse in charity "believing all things" as the scriptures state and not assuming the worst of the Catholic Church. However, if you stray from this attitude and begin to try "scoring points" with a warped view of Catholic theology, building up straw men all around your self, then I am out. OK, so through the gift of sanctifying grace, the divine person comes to dwell in the rational creature. The divine person is uncreated so this is the uncreated aspect of grace. Seems to support what I am talking about. The divine person who comes to live in us in Sanctifying grace is divine, uncreated. The gift of that state of him being in us is a created gift because the state of his being in us could not exist until we were created. Thus the State of Grace is created while the person and substance is not. Yup, the gift itself is given by the Holy Ghost. I agree. Semantics. The gift or state of God being in us is a created state. The person who is in us is uncreated. Balitimore Catechism defintion of Sanctifying Grace: God's life (uncreated) in us (created). This is oneo f those areas where I absolutely believe that the EO Church and the Catholic Church believe the same thing but use different termonology. I would never call the teachings of the Universal Doctor of the Church "not worth straw". Popes have told us that to deviate from the teachings of Thomas is very dangerous. I agree because his Summas are very reliable summaries of the teachings of the Fathers from a western persepctive. I would not deviate from his teachings except for a very very very very good reason, such as in the specific cases where the Church judges him to be wrong (The only one I can think of off hand is his understanding of the sanctification of the Blessed Virgin Mary). No, I am a Thomist through and through just as many of you Palamites. Consequently, the day before my father had his break down, he and my mother had purches the Summa Theologiae for me as an early birthday present. Very generous of them indeed. I have been delving into it every free moment that I have. Anyway, back on topic, I suggest for reading to all of us (myself included) a book called The Ground of Union. Its about the similarities between Aquinas and Palamas on deification. God's grace being within us is a created state. We did not always exist and thus God's life could not be in us until we were created. Thus we have the Catholic Concept of the State of Grace. I disagree with the ideas that I italicized. We are creatures (like you imply, we are created). However, to focus on our state and interactions with God (Grace working or "being" in us) as a way to define what "kind" of Grace us in us as creatures is theologically presumptuous. That is not the wayto define it, i.e. our condition. We have to start with God, Who always existed. What defines how Grace works (or is in us) in us is not whether we are created or not, but whether or not Grace (God's energies) are created or uncreated. It is the teaching of the Orthodox Church that God's divine energies are uncreated and the interaction or growth or process (Theosis) or those energies at work in us transform our created energies into uncreated energies. We do not become uncreated at the level of essence, (our being; meaning this does not change the reality that we were created) but at the level of energies. A key distiction is this: you call the grace in us "created", and say that that "created Grace "comes from" God. It is the opposite of the Orthodox Faith. The created grace (or energies) in us are not from God, but in us. They are created because we are created, but also because we are not deified, we are not divinized and we suffer the separation of God because of Ancestral Sin, the Sin of Adam. When Christ was Incarnate and suffered Crucifixion, died, was buried and resurrected (CHRIST IS RISEN! TRULY HE IS RISEN!) he bridged the gap between God and man. As St. Athanasius says following St. Irenaeus, "Christ become man so that we could become God". This, through Theosis, and the striving to overcome the passions allows man to dispose himself to virtue which opens up the soul to receive the uncreated energies of God, when and how God pleases to work in that man. I think you are missing the point. I agree. The energies of God are uncreated. I am not denying that even for a second. God is NOT created. And when he is in us he remains uncreated. I am only saying the state of Grace, (the state of God being in us) not God himself, is a created state because I cannot be in that state until I exist. To believe otherwise would be a logical inconsistant. I think that the problem here is that the word Grace is being used in two different ways. Eastern Usage of the term Grace: God's energies. If that is how we use the term, then absolutely, I would be forced to agree that Grace is uncreated. Western Usage the term Grace: The state of God being in us. This would have to be created because the state of God being in us is a created state. Notice here the emphasis on the state being created while God himself is not. I prefer the Eastern usage and the term Uncreated Grace much more because it is much less prone to confussion but I have no problem with the western one in that it does not deny the truth that the Eastern usage teaches us: God is uncreated and literally comes to live in us and deify us. I am reading carefully your response and I understand what your point it about the "state" of Grace in us being created. I believe that with the semi-scholastic, thomistic theology of the Church of Rome that it would be logically inconsistent to call the state of grace in us uncreated. However, I disagree with that theological explanation. I cannot be reconciled adequately with the Orthodox understanding on this point unless it is abandoned. This is because an Orthodox Christian would say that even the "state" of energies being in us is uncreated because the uncreated energies being in us is itself an uncreated grace. It's not semantics. If the "Grace" (or divine energies) that come from God are uncreated, then the act of God acting in us (i.e. the "state") is also uncreated because the act is initiated by God. The Grace to receive the Grace of God is itself a Grace from God and God's Grace is uncreated. Interesting. I see what you are saying. I would say that from that perspective it would be appropriate to refer to the state as uncreated as well. Again, I don't think it wrong to refer to the state as either uncreated or created because we are using the term in different ways. You are saying that the state is uncreated because it is an act initiated by God who is uncreated. Am I correct in assuming that you believe that even the "state" is God's energies? I would still maintain that it would be appropriate to also call the state created because the state of my being in God's grace did not exist at one point. Then I was created, then baptized, then the state of me being in God's grace did exist. To come from non-existence towards existence requires an act of creation on God's part, thus the state could be referred to as created. I think this is alot like Augustine's dicussion in Confessions where he talks about whether we are in God or God is in us. Both statements are correct, when approached from different perspectives and both gaurd a sacred and important truth. That being said, I prefer the Eastern usage and understanding better but I think they both basically profess the same thing: God almighty, the uncreated one, enters into us and transforms us, even deifying us. Can you provide some EO sources concerning the "State" of being in God's grace being uncreated? I was referring to sanctifying grace. The Roman Catholic concept of Sanctifying Grace is most closely related to the Eastern Orthodox concept of Theosis, a process of personal purification and deification initiated by God so that we can acquire a genuine union with Him by actively internalizing our personal relationship with Him, and thus more fully participate in His Divine Nature. In this way, we become united with God by grace in the Person of Christ through total participation in Jesus Christ. This is a gradual process by which a person is transformed and united so completely with God that he or she essentially becomes by God's Grace what God is by His Divine Nature. You have understood my point correctly (I highlighted it in our text). However, as an Orthodox Christian, I don't really use the phrase "state of grace". I use Theosis, Deification, Divine essence and Divine energies. I was using your terms to explain an more Orthodox understanding. My point on this is that what we do does not change God's Work or action in creation. God does not change His mind to counter-act our transgressions. The "state" or "reality of being" in the God's Grace is not this thing or another. It seems almost along the line of Origen's understanding of the fall (i.e. that man fell from perfection to imperfection). The idea that we are born without Grace, then we are in Grace, therefore the state of being in the Grace of God is a created state places too much emphasis on what we do or do not do. We are never without the Grace of God, even in Hell. It is God's Grace that keeps each and everyone of us in continual existence. St Maximus takes this even further when he explains our lot as created beings (man). He teaches, in the tradition of the Fathers that all of us will have ever-being (none of us will cease to exist). Christ's Incarnation and Resurrection is the reassurance of our Salvation. And truly, in this way, all will be saved. However, not all will have well-being (that is, not all will be in Heaven with God). Some will have ill-being (that will be in Hell). So, we see here, by the very fact that mankind will have ever being shows that it does not matter whether we initiate. Rather, God already initiated the Divine Plan of Salvation of man, even before man was created. think this is alot like Augustine's dicussion in Confessions where he talks about whether we are in God or God is in us. Both statements are correct, when approached from different perspectives and both gaurd a sacred and important truth. I am a wretched sinner with a impoverished view and understanding of the Divine Realities of God. Forgive me if I have caused any confusion. I am interested in many discussions and I hope my input was helpful and not antagonistic. One more apt and able in Theology might provide some sound teachings for you here on this board. Otherwise, I would highly recommend contacting Reader Patrick Barnes, webmaster of orthodoxinfo.com. He would undoubtly be able to help you further. You did not say that. See your first message. If grace is God, how can it be both created and uncreated? How can God be both? How do you reconcile your personal opinions with what has been given from Thomas Aquinas in Message #13? Where would we go looking for the official Roman Catholic teaching? If sanctifying grace = uncreated grace, why is Karl Rahner credited with "discovering" this in the 1930s and 1940s? Will you explain to me in study hall just what it was which he discovered and how it differs from previous Catholic doctrine? Will you explain to me if his teaching, which as far as I know is still simply theological opinion, became official Catholic doctrine? Will you bring along the Encyclicals and Apostolic Constitutions which have proclaimed it so? I think that we need to hear the official voice of Peter. The Balitmore Catechism calls sanctifying grace, "God's life in us". Its clear that God's life is uncreated so then it is uncreated grace. The "in us" part is created because I am created. This is all very clear to me from the definition. I am not sure how you are missing this, unless of course you just don't want to see it. Again, I think we are just using all the termonology in different ways. I suggest you pick up the book "The Ground of Union" and give it a fair read. This is all very helpful and I think that you did a fantastic job explaining your point of view (which I assume is the EO point of view). My only concern is that there seems to be a lack of understanding of the difference between God's grace that is present in all things holding all things together, and God's grace invited into our souls for the purpose of deification. This state did not always exist. So I think it fair, to call it created from one persepctive, in that the state itself was not always there. But its also fair to call it uncreated in that it comes from the uncreated God himself, in fact, the substance of that Grace is God himself. I am more and more convinced that we have the same view but use different words in different ways, coming at the mystery from different perspectives. I suggest you pick up the book "The Ground of Union" and give it a fair read. No thanks. When did Williams write her book? About 10 years ago. It was hailed as unique, ground-breaking, a watershed. Well for a traditionalist such as myself any theological work which is hailed with such adjectives is under immediate suspicion. It is part of the re-invention of Roman Catholicism, part of the pretense that doctrine which they have reviled (and they have certainly reviled the concept of theosis, etc., just read Fr Adrian Fortescue and the Catholic Encyclopedia) has always been an integral part of Roman Catholic teaching. It is for these reasons that I do not like these discussions with Catholics. They offer nothing solid but just the varying opinions of in-vogue theologians. What was unknown by the theologians of last century is presented in this century as if it were always Catholic teaching, and probably in the next century it will have passed out of the consciousness of the theologians and been forgotten again. It is for this reason that I say: please give us the official papal teachings. 2)When you say: "the state of God's life being within us is a created state because we did not always exist to have God in us", does this mean that the First-Created, pre-lapsian humans were not in the state of grace before the fall? This would differ with Orthodox theology I think. Theosis is actually our natural state and what we were created for in the Orthodox mind. 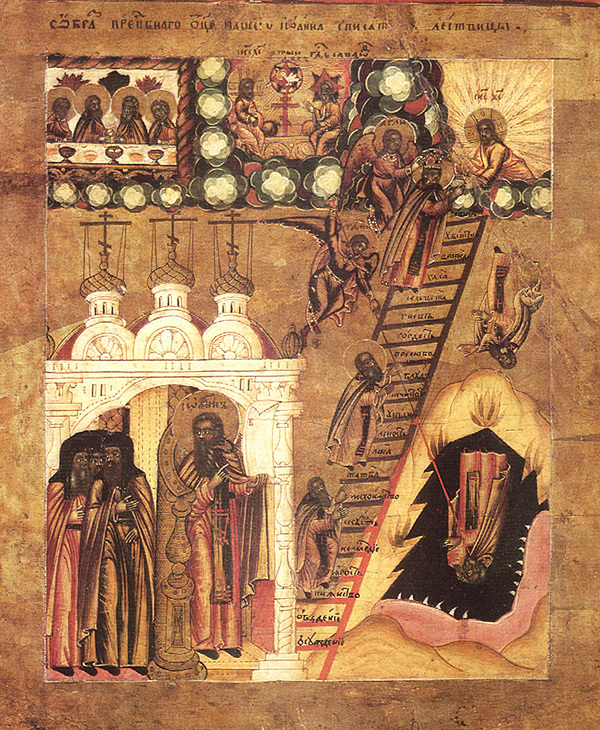 My understanding (from a Slav background) is that the possibility of theosis is a unique gift which Christ brought to humanity. It was not part of our original condition in the Garden. What Christ has made possible for us exceeds what was originally intended for Adam and Eve and for our race. In other words, Baptism does not achieve a "return to the Garden." It offers something far greater, the possibility of theosis. "Man, however, being endowed with reason and free will, received the power of continuous union with God through his own choice, if indeed he should abide in goodness, that is in obedience to his Maker. Since, however, he transgressed the command of his Creator and became liable to death and corruption, the Creator and Maker of our race, because of His bowels of compassion, took on our likeness, becoming man in all things but without sin, and was united to our nature. For since He bestowed on us His own image and His own spirit and we did not keep them safe, He took Himself a share in our poor and weak nature, in order that He might cleanse us and make us incorruptible, and establish us once more as partakers of His divinity." Indeed there's nothing that St John of Damascus can't answer! "For many fathers, theosis goes beyond simply restoring people to their state before the Fall of Adam and Eve, teaching that because Christ united the human and divine natures in his person, it is now possible for someone to experience closer fellowship with God than Adam and Eve initially experienced in the Garden of Eden, and that people can become more like God than Adam and Eve were at that time. Some Orthodox theologians go so far as to say that Jesus would have become incarnate for this reason alone, even if Adam and Eve had never sinned. " You know, this is a very interesting question because I have been told that we should not identify Grace with the Holy Spirit only because its God's life in us. I have understood that to mean that the entire life given Trinity dwells in us, not just one hypostasis. Feel free to correct me if there is something wrong with my Trinitarian theology here. I'm gonna check the Summa on this later during study hall. I would have to say that Catholics would agree with the Orthodox on this point. Man did in fact have sanctifying grace in him before the fall. Something I often state on this matter: It is not natural for man to be without supernatural grace. However, this does not change the fact that the state of being in God's sanctifying/deifying grace, that status did not exist until God created beings to be in that state. Thanks for asking great questions and I will read more about question one later today. I am going to have to start reading the works of St. John. This passage is great! Also George, does the EO church identify uncreated grace with the Holy Spirit? Thanks. If Sanctifying Grace is the gift of God's life to us, then from this persepctive it must be uncreated because it is God's life. Again, if Sanctifying Grace is the gift of God's life, then it must be uncreated. It seemse here that there is a difference though between Sanctifying Grace and Holy Spirit because it is the Holy spirit who infuses the gift. This at least has always been my understanding and the position put forth by the Catechism. I think we are running into another problem here in the Catechism and the Summa. What I see is that the term Sanctifying Grace is used in two different ways. At times it is used to refer to the uncreated gift of God's life. At other times it seems to be used to refer to the gift of making the soul suitable for God/God's life to dwell in us. Certainly, the gift of God's life is uncreated. However, the preparation of the soul for God's life, that might be considered created. Man's state and grace prior to the fall. In the order of the creation of spiritual beings, man follows the angels, the bodiless beings, of whom some fell by disobedience and became evil spirits. Man was created "with all the physical and spiritual endowments necessary for the fulfillment of the end for which God had foreordained him.' (Androutsos) This is the teaching of both the Fathers and the Holy Scripture. The words "let us make man in our own image, after our likeness" have always been taken to summarise man's endowment of faculties, powers, and character....."
Rhosse: "image" applies to the endowment of man's nature with reason and free will, both as resident faculties and as functioning energies. "likeness" expresses the desire and impulse and tendency (spoudi) rightly to develop his innate powers to become like God and achieve, as much as lay in him, actual perfection. Androutsos: the original state of man is one of perfect harmony in a three-fold relationship - towards himself, towards nature, and towards God. The state of unfallen man was not a complete and perfect thing for it was only potential. It was oriented towards progress in human perfection and not towards deification which was a potential not given to man prior to the advent of the God-man and the union in him of the human and divine natures. Mesolara: The original state of man was one of potential perfection of body and soul, which could be made actual by the free cooperation man's will with the will and grace of God. towards the realisation of the end for which he was designed. God's grace and cooperation with man was contingent of man's response, and were forfeited through the fall. So man's perfection was not realised until the coming of the Perfect Man. Pages and pages more but it is time-consuming to type them out - I am a two finger typist. Sanctifying grace, etc. While Roman Catholics divide grace into a large number of categories, sanctifying, habitual, prevenient, co-operating, etc., these categories are not known in Orthodox thought, Adopting RC terminology often makes it difficult to explain and argue for the Orthodox teaching since the use of an RC vocabulary forces, to some extent, the adoption of a Roman Catholic approach. No, Grace for us is the Divine Energies which emanate from the Holy Trinity (not just the Spirit). Thank you for sharing these notes. They are now part of my files. Ok. I think that the idea that Sanctifying Grace is God's life in us can be reconciled with that. I'll agree with you that Grace is the Divine Energies (i.e. God himself). I have to confess that my problem all along in this kind of discussion is that it's not clear to me what uncreated energies are supposed to be being distinguished from. Using "energies" in English is already a problem because as far as I can tell the theological significance is at odds with the normal meaning. But when we get to "created energies" (the possibility of which is implied by the distinction) things seem to me to break down badly when forced into ordinary language, because creating is (as I understand it) an energy itself. But "created creating" comes across as gibberish. I am loathe to accept the concept of an energy unless I can fit things into it; and as best as I understand it, the kind of things I can fit into the concept do not accept "created" or "uncreated" as predicates. Therefore I cannot identify a Western position that this is supposed to be in response to. Now, there is clearly a tendency to understand grace as a substance; but saying "uncreated energies" invites that misunderstanding, because energy is a substance. I sometimes find it helpful to think of "Energies" as "Divine Operations". For example, consider the the Divine Operation of God's Love. God's Love is not an "emotion" of the Divine Nature, but a Power Which has an influence on Creation as well as being a Power within the Holy Trinity (The Father Loves the Son and the Spirit, the Spirit Loves the Father and the Son etc.). There was not a time when God's Love did not exist, therefore, God's Love is Uncreated, and anything Uncreated is God, therefore the Apostle St. John is able to say quite truthfully that "God is Love" (1 John 4:8 ). Grace, from an Orthodox perspective, is the Uncreated Energies (Operations) of God which, when They encounter created objects, produce and effect the way fire causes iron to glow when they encounter one another. The effect (i.e., the glowing) is created, but the fire (Grace) which caused the effect is Uncreated. I think that I can agree with this and still not transgress the teachings of my Church. At least this is my understanding on grace, though I don't really use the essence/energies terminology (although I believe that it can be reconciled with my Church as well). I sometimes find it helpful to think of "Energies" as "Divine Operations". For example, consider the the Divine Operation of God's Love. God's Love is not an "emotion" of the Divine Nature, but a Power Which has an influence on Creation as well as being a Power within the Holy Trinity (The Father Loves the Son and the Spirit, the Spirit Loves the Father and the Son etc.). This is walking out into an area of theodicy into which I for one am loathe to venture. Scripture testifies at length that God does have emotions-- at least, if you take the text at face value, it does. It make sense to postulate that there is no the distinction between impulse and action in God that there is in humans, and I think that this would be supported in the West in those places where there was any interest in such questions. The part that makes me dubious is that this is founded in human notions about the perfection of God. But again, the more basic part isn't something that I could find thoughtful objection to. Indeed, modern Anglican theologians would urge something of the same viewpoint; the idea is more or less that which the mainstream of western theology has been saying for at least half a century. I cannot comment on how compatible this is with Thomist scholasticism, but then again I don't care that much. We're still stuck, though, on that word "uncreated", because (as you say) God doesn't Himself have any created anythings. What is created (we have from doctrine) is not God. My objection is not therefore with the idea, but the terminology. The commitment to a set of very misleading words in English is something that really has to end. The "essence/energies" distinction appears to be nothing more than a distinction between what God is and what He does; but over most levels it is a distinction that doesn't have to be made. Likewise, we still seem to have this implied category of "God's created actions", which is doubly nonsensical. And last, the classic error was the tendency to reify grace into a substance; this language tends to amplify the problem not diminish it, because "energies", as I said before, does tend to sound like a substance. So (putting on my cap and hood) I think the general Western answer would be, "we mostly agree with what you are trying to say, but you need to find a less misleading way of saying it." The "essence/energies" distinction appears to be nothing more than a distinction between what God is and what He does; but over most levels it is a distinction that doesn't have to be made. If His Power is Eternal, it is uncreated and is therefore God Himself, yet His Eternal Power is distinct from His Godhead. And how else can St John say that "God is Love" if the Divine Love is not (a)Uncreated and (b)distinct from the Divine Nature? 2) God is Transcendent in His Nature and no created thing will ever come close to the Divine Nature. 3) Grace (which is God) is immediate and permeates everything. If we just say (1) and (3) without (2), we contradict the notion of the Transcendence of God. The only way to explain it is that Grace is God but not His Divine Nature.